Rockland County, NY - One day after Winter Storm Quinn blew through the greater New York area, the National Guard has been called into Rockland County, which was slammed by the second nor’easter to hit the area in less than a week. County Executive Ed Day made the announcement on Thursday, noting that a change in the precipitation between 5 and 7 PM during the Wednesday storm caused significant problems to area residents. The resulting heavy wet snows took down trees and branches, blocking roads and knocking out power to several thousand area residents. Approximately 17 inches of snow fell in the Monsey area and, more than just creating headaches, the storm also took two lives in the region. An 88 year old Sloatsburg woman died on Wednesday when she was hit by a falling 35 foot evergreen as she was shoveling snow in her driveway, reported The Journal News (http://lohud.us/2tpAfB8). Further south in Franklin Lakes, New Jersey, an unidentified driver who tried to drive around a live power line died this morning when their vehicle burst into flames. The power line had been blocked off by road cones. As reported earlier today by VIN News. At a press conference held this morning, Ramapo supervisor Michael Specht said that the local police department has been working around the clock on “life-saving matters,” and asked area residents to postpone any non-emergency calls to the police until tomorrow. 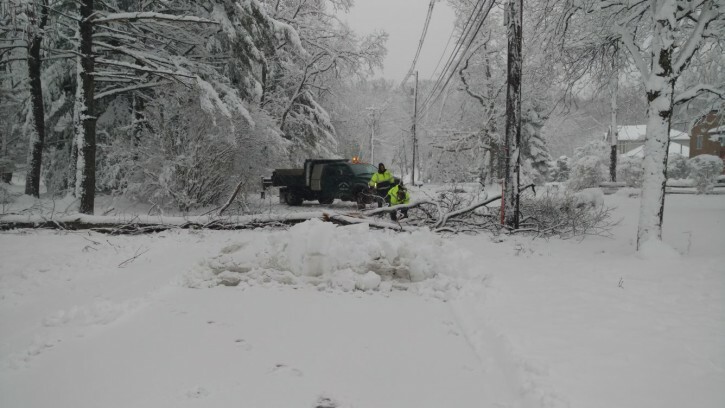 As of this morning, more than 4,500 Ramapo residents were without power, including 1801 in Airmont and the unincorporated Town of Ramapo, which includes significant portions of Monsey. Orange and Rockland Utilities said that 700 of the homes without electricity in unincorporated Ramapo were affected by a single incident, with no estimated repair times available for those customers. Highway superintendent Fred Brinn acknowledged that not all area roadways had been plowed yesterday because low hanging power lines that were brought down by the storm prevented trucks from going through. Brinn also emphasized the importance of staying off the roads when the snows hit. The East Ramapo School District cancelled classes for the second day in the row because of the effects of the storm. Many yeshivos chose to open anyway, with parents having to arrange their own transportation for the day. Less than 30 miles to the north, Kiryas Joel received far more snow than Monsey, but conditions were significantly better. Kiryas Joel public safety director Moshe Vitriol said that he was unaware of any power outages in the village, despite having received 26 inches of snow. Village schools opened today after a two hour delayed start and the only significant incident reported yesterday was an out of control snow plow that hit two cars as it skidded down a snowy hill.